We purchase only the top-quality screw products from around the world so the end user is completely satisfied and there is no product failure or waste. 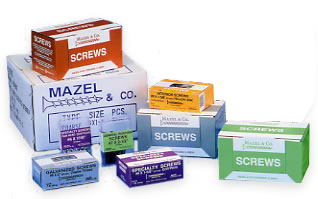 Our broad line of screws are offered in bulk boxes, large contractor boxes, one pound packages and clear plastic packs with all come in manageable sized, sturdy, self-displaying master cartons. Color-coded boxes identify the types of screws and easy-to-read, UPC coded labels specifically identify the product. Our extensive line of construction screws includes many sizes of coarse, fine and low-high thread drywall, yellow zinc dichromate, Philips and spuare drive galvanized, Philips and square drive , stainless steel decking and trim head screws, pan head framing, self drilling, Philips and square drive trim head and other specialty items. Mazel & Co. offers a wide selection of construction fasteners that feature the highest standards in manufacturing and packaging to insure that our customers will have a high quality, comprehensive and competitively priced fastener line that is profitable for their stores and satisfies all their customers' needs.